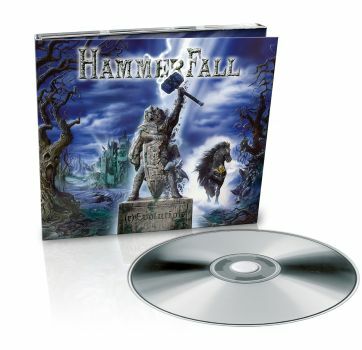 HAMMERFALL - (r)EVOLUTION LTD. EDIT. (DIGI) | Online Shop | Wizard LTD. Album: "(r)EVOLUTION LTD. EDIT. (DIGI)"
»(r)Evolution« not only has HAMMERFALL reclaiming their rightful place on top of the metal globe, but also taking things back to the roots in many ways. Once again the band has had production duties handled by none other than Fredrik Nordstrцm, who helmed their two milestone releases »Glory To The Brave« and »Legacy Of Kings« in the early years of the band’s history. “The last time we worked with Fredrik Nordstrцm back in 1998, so it’s definitely been a while! Fredrik is a very vital component in making the album sound the way it does, and I think it was the perfect match once again”, states Dronjak. The music recordings for »(r)Evolution« took place in March and April 2014 at guitarist Oscar Dronjak’s Castle Black Studios. Vocalist Joacim Cans went to the United States for vocal recordings, working with James Michael (SCORPIONS, MOTLEY CRUE etc. ), who also did a great job on the predecessor »Infected«.